Twitter has partnered with ‘music intelligence platform’ The Echo Nest, to allow third-party developers to easily link tweets from musicians to wider data about their music. Developers will now be able to include Twitter usernames and tweets from music artists with Verified Accounts within their apps. 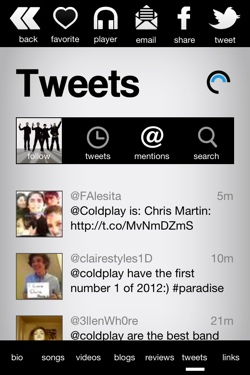 Imagine a music player app that pulls in the latest tweets from the currently playing artist, for example. This will now be possible with a few lines of code. The deal sees Twitter data becoming part of The Echo Nest’s Rosetta Stone service, which lets developers use music data from a wide range of APIs together. It also supports data from the likes of the Musicbrainz database, Facebook artist pages and songs on the Rdio and 7Digital services. Twitter is increasingly a media company these days, having become an important part of many journalists’ work, as well as being integral to some TV and radio shows. Letting developers integrate Twitter data into music apps is yet another manifestation of the way the service is working its way into our activities and entertainment away from Twitter itself. The only downside of this deal is that it only supports music artists with Verified Accounts. While some big names have had their accounts given the stamp of authenticity by Twitter staff, a huge number of musicians will lack that blue ‘check’ icon on their profiles. Twitter currently doesn’t allow people to apply for verification, instead verifying people on a seemingly ad-hoc basis – the most recent well-known example being when co-founder Jack Dorsey appears to have verified Rupert Murdoch’s account on New Year’s Eve 2011. However, Twitter’s verification process was called into question when an account purportedly run by Murdoch’s wife was verified before being revealed as a fake. If Twitter is allowing developers to use Verified Accounts as a trusted data source within their apps, it will need to open up a solid verification process that is both accessible and transparent. One app is already using the new Twitter/Echo Nest integration. 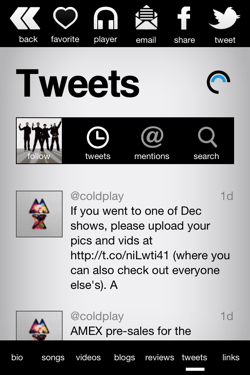 Discovr Music for iOS has been updated to pull in tweets from artists, as well as mentions of them from other Twitter users, as seen in the screenshots below.